The 300S is equipped with a 5.7-inch color flat panel display (replaces the cathode-ray monitor of the VRO300) for position values, dialogs and inputs and soft keys. The soft keys are used for diverse functions, mainly for operation and parameterization. The 300S display unit is designed as a sturdy upright unit with splash-proof full travel keypad for use in the workshop. It supports all operations with straightforward interactive menus on its large, easy-to-read color flat screen. 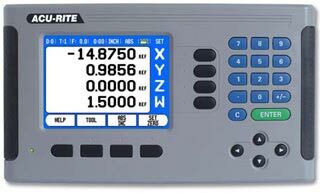 In addition, the 300S is capable of all the functions of a programmable counter, such as the creation, editing, storing and running of programs. Numerous programs with differing names can be saved in the program list.